THE CITIZEN ROSEBUD: Happy New Year! Thank you friends for sharing a year with me. I wish for all you a very happy, healthy and prosperous New Year. Yay may the new year be filled with lots and lots of sparkles for you. Happy New Year hermana. Enjoy the break!!! Have a Happy New Year. May it bring only happiness and good things. Happy New Year to you, Bella!! Enjoy your break. Wishing you a Happy New Year and fabulous 2013!! Happiness in the new year to you Bella! So glad to be a part of your bloomin' world. Enjoy your break and make this a year to remember! Happy New Year, Bella! Enjoy your sabbatical!! A very, very Happy New Year to you! happy new year lovely lady! come back soon! The best is yet to come... Happy new year, Bella!! Love your sparkly eyes! Enjoy your break! Happy New Year Bella! Have a relaxing well deserved break and look forward to connecting again in 2013. You are a gift that keeps on giving! Happy New Year and wishing you tons of fun in 2013! Happy new year! 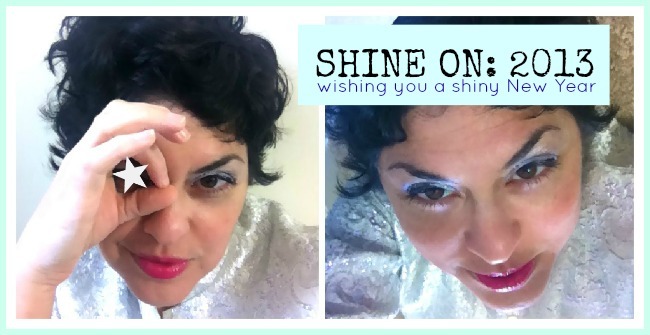 Have a great break & shine on you crazy diamond! Shine on you crazy diamond... you MAGNIFICENT diamond. Happpy New Year! Your make-up looks so pretty! Shiny eyes! Love your sparkle! happy new year, My Dear Sparkle & Starry Lady, wish you an inspiring and fabulous time, just because you deserve it and you rock!! Have a great New Year! Enjoy your time off. Guess we'll just reread a few of your old posts when we need our Bella Fix in the next few week. By the bye, I spent Christmas in Sacramento in such pouring rain, I thought of you up in Seattle. Happy New Year beautiful Bella! May all your dreams come true in 2013. Happy New Year lady! Have a wonderful vacation! Happy 2013 and I hope that you enjoy your time off. Wishing you a Happy & Prosperous New Year, Bella! You are so wonderful. I'm glad we're internet friends. Would love to meet you in person some day. Happy happy new year to you! Beautiful photos Bella! Have a good time! You have been an inspiration me all year 2012. I wish you a happy, creative and succesful 2013. Love and big hugsss from Bangkok! Happy New Year to you! Enjoy your break! You're lovcely in sparkling ! Enjoy your break. Question: May I come with you? I so need a break too (have had company for 3 weeks....). So good to be back on the blog planet. You look pretty in shimmer. Happy new year to you too! Better late than never I suppose but I hope you had a great New Year!